Salicylic acid face washes are best in cases of acne prone or oily skin due to its keratolytic, comedolytic and anti inflammatory properties. 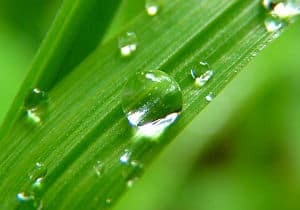 In specific, salicylic acid belongs to the BHA acids and what it does better than AHA acids is that it penetrates deeper and declogs skin pores as well as prevent the formation of blemishes, including whiteheads and blackheads, that are formed when skin cells and oil get trapped in the pores. Salicylic acid controls oiliness, boosts the cell renewal and increases collagen production. Still, keep in mind that it can cause photosensitivity, so the use of a sunscreen is always necessary before exposure to the sun. Depending on the salicylic acid product, salicylic acid can cause mild irritation, redness and a light burning feeling on the skin. OTC treatments that contain between 0.5 to 2 percentage of salicylic acid are considered safe to use, still you will need to check gradually how your skin handles this ingredient and, of course, people that are allergic to aspirin should stay away from salicylic acid which is also not recommended for sensitive or very sensitive types of skin. Based on this ingredient’s effectiveness when dealing with oily or prone to blemishes skin, I have decided to review here some of the best salicylic acid face washes for acne which I hope you will find useful. The Perfect Image Salicylic Acid Cleanser is designed to treat non-inflamed acne and unclog pores to help reduce and prevent acne breakouts. It can be used prior to a facial peel or as a deep pore cleanser. It contains some great skin healthy ingredients other than the salicylic acid including Tea Tree Oil (which kills bacteria), Green Tea (anti-bacterial and anti-inflammatory) as well as Chamomile and Comfrey extracts which have soothing, healing and skin repairing qualities. This deep facial cleanser comes in a 4 ounce container and is free of parabens, phthalates and sulfates. It doesn’t contain any gluten and is cruelty free. It is made in the USA using sustainable practices and materials. The bottle is also made with recyclable materials. Besides, it is recommended that this wash be used 2 to 3 times a week and that you only use a dime size amount for each wash. Reviews for the Perfect Image Salicylic Deep Gel Cleanser are very good. Users state that it works exceptionally well especially when combined with the chemical peel created from the same company. They also say that it makes their face feel and look clean, working great to remove dirt, oil, and make-up. Retseliney Acne Face Wash is a natural and organic cleanser that contains willow bark, an ingredient that naturally contains salicylic acid. The percentage of salicylic in this acne cleanser comes up to 2%. 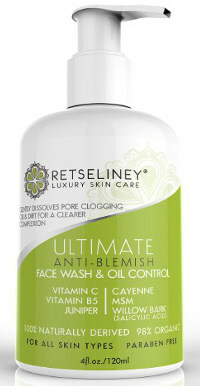 The company claims that, unlike other face cleansers for acne, Retseliney Acne Cleanser does not have any negative side effects like redness or over dryness. It is gentle, yet effective, so it is suitable even for sensitive types of skin. Not only does this product cleanse the top layer of the skin but it also penetrates deep into the pores to eliminate and prevent different types of blemishes like acne, blackheads and whiteheads, pimples, zits and bumps. It contains natural and organic ingredients and I wasn’t able to find any harmful chemicals in its full list of ingredients. Some of its components are organic aloe and lavender, coconut oil, witch hazel, MSM, vitamins B5 and C as well as cayenne and rosemary seed extract. This acne cleanser is made in the USA, comes in a 4 ounce container and is backed by a 100% money back guarantee. It comes with a money back guarantee and is suitable for women, men as well as teens. Reviews for the Retseliney Acne Wash are very positive. Users report that it does help to reduce breakouts and even out their skin tone. They find it easy to use and state that it only takes a very small amount of the product to leave their face clean and soft. People like its gel like consistency and say that it doesn’t leave their skin feeling dry or tight. They also mention that it helps to relieve oily patches on their face. The Body Merry Exfoliating Cleanser contains 2.5% Glycolic Acid as well as salicylic acid and jojoba beads to unclog pores and get rid of dead skin cells. While rosehip oil and olive oil nourish your skin, tea tree oil can deal with bacteria and Kojic Acid will give you a brighter look. According to the company, their gentle wash cannot only help with acne and acne scars, but also minimize age spots as well as sun spots and help with premature aging. In my view, this claim must be based on the fact that glycolic acid, as all AHA acids, are able to exfoliate effectively the upper layers of the skin, leaving you with smoothened fine lines and wrinkles. This product comes in a 6 ounce container and like all Body Merry skin care products, it is followed by a 90 day money back guarantee. Ratings and reviews for the Body Merry Glycolic Acid Cleanser are very good. Users report that it does help to clear up their acne and control the excess oil. They think it works as a very good exfoliant, resulting in a clearer and smoother skin. It deep cleans their pores and results in a brighter looking complexion while at the same time it is gentle on their face. However, few users felt that its scent is somewhat off putting. Neutrogena Oil Free Acne Wash contains 2% of Salicylic Acid and comes in a 6 ounce container. By looking at the full list of ingredients, I could find a few which can be irritating, especially for sensitive skin types, such as colorings Yellow 5 and Red 40 as well as fragrance. Other non innocent skin care ingredients listed in this cleanser are PEG-80 Sorbitan Laurate and propylene glycol which is better to avoid if you suffer from eczema. Reviews for the Neutrogena Oil Free Acne Wash are very positive. The vast majority of users mention that it really helps to reduce whiteheads and blackheads as well as reduce redness caused by inflammation. They also say that it minimizes the number of acne breakouts and leaves their skin feeling soft and clean. It lathers incredibly well and rinses clean. While some users don’t like the scent of this face wash, others state that it has little if any scent at all. Other people admit that this acne wash is too strong for their type of skin. The Phisoderm Anti-Blemish Gel Cleaner contains salicylic acid and comes in a 6 ounce container. Although it is free of soap, dyes and alcohol, most of its ingredients are not so natural looking. Still, ratings are very positive with users finding that this facial cleanser is non-irritating and that it removes oil deep down in the pores. They also mention that this salycilic acid cleanser slows acne breakouts, making their face feel clean. They feel that it is gentle on their skin and leaves it soft, adding that it goes a long way making it an excellent value. The Alba Botanica Acnedote Deep Pore Wash contains 2% salicylic acid as well as a number of natural and organic ingredients including camelia leaf extract, witch hazel and others. It comes in a 6 ounce bottle and is free of parabens, synthetic fragrances and phthalates. Furthermore, it has not been tested on animals. This deep pore facial wash gets above average ratings with users stating that it really reduces acne and results in a smoother brighter skin. They also mention that it is not overly drying and reduces inflammation of the skin. However, potential users should note that there are a few negative reviews with people saying that it gives a burning feeling on their skin, which might be due to the salicylic acid’s function. In conclusion, salicylic acid face washes can be great for deep cleansing and preventing acne breakouts and other kinds of blemishes. Still, you need to check out how your skin reacts to them before you decide to add them as a staple in your skincare routine.